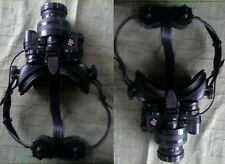 INFRARED (IR) NIGHT VISION GOGGLES NVG. Goggles could be used for variopus activities. Goggles could be used by anyone and are easy to set up. Night Vision Goggles. On top of the goggles are three switches. Typical Night Vision Goggles do not shine any light outward. They only enhance light that is already present. These IR goggles are limited by how far the infrared light can shine. These goggles work great in pitch dark, and are designed for use indoors or in small yards. Armasight Nemesis 6x Night Vision Weapon Sight. 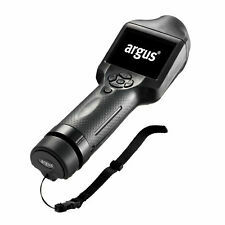 Condition is Used but Works Very Well for Field Hunting in any low light/no-light applications. Selling because I've upgraded my Hog Rifle Scope to an Armasight thermal unit and am trying to clear out some space in my safe. Item is as seen in Photos, and missing rear rubber eyepiece. A Bargain With A Low Starting Bid!!! Gen 3 11769 Can be used in a PVS-14 or other scopes. One pair of goggles. 2 pair of goggles and 2 flashglihts. Goggles with the IR-Flashlight : SEE 500 FEET. This scope is easy to mount with 30mm standard rings and it's easy to use with the zoom wheel and classical ergonomic buttons. Sighting in your4K Pro withOne Shot Zero easy; take a shot to adjust your reticle and you are ready to hunt. 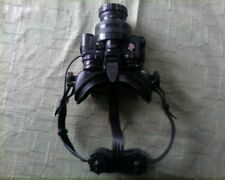 This is a Digital Night Vision IR Goggles / Binocular by Jakks with a Built In Hi / Low Power IR Illuminator. See in total darkness. You can view in standard vision green or white. See through both eyes! 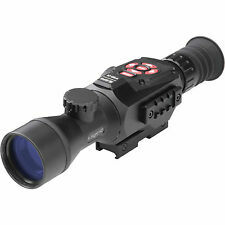 ATN X-Sight II HD Day/Night Vision Rifle Scope 5-20x WiFi 1080p GPS. Condition is Used. Shipped with USPS Priority Mail. Very mild use works 100% as it should ready to go!! Model: Picatinny Rail Mount, PVS-14 Moocular. Color: Black. Make your shots at ranges previously undo able with a digital or a night scope. Ballistic calculators were never this easy. No more charts, complex reticles, and calculators. The ATN Obsidian Shooting Solution does it all. I've decided to get the top of the line model and part with this one. Sensor ATN 4K M265 Sensor, 3864 (H) x 2218 (V). Core ATN Obsidian IV Dual Core. Night Vision Mode Yes. Micro Display 1280x720 HD Display. Field of view at 1000 yds 240 ft (5°). Smart Range Finder Yes. Sold the gun I was going to use this on! Only tried it out once at the range and it worked great. Like-new condition. MPN (Box/Item): NVWSNAR620. Magnification: 6x. IIT Generation: 2. Night Arrow is designed to use 1 AA type battery. Product Condition: Light wear on the mount. Illuminated center red reticle for optimal contrast against a dark or light target. New PVS-14 Kit (No Image Intensifier). This is a new straight from thefactory. All you need to build your own Pvs-14 is a MX-11769 or 10160. • Close Focus Stop (A3144322). • Objective Set Screw (A3256357). Scope has bore sight assembly attached. U.S. SALES ONLY. 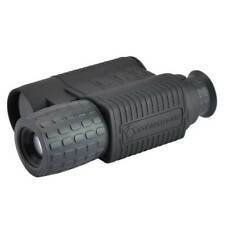 Yukon Night Vision Monocular Nightfall 3X44. Condition is Used. Shipped with USPS Priority Mail. Will only ship to the US. Has been used but works well. No scratches on lenses. 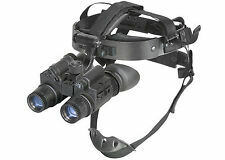 The Ghost Hunter Binocular can be used two ways. Equipped with a head mount, the device can be mounted for comfortable, long-lasting, hands-free operation, or hand-held when searching for prey. Featuring a high-power infrared illuminator and a 1x magnification, the Ghost Hunter Binocular provides a bright, clear image for short-range targets in low-ambient light conditions or total darkness. Armasight ORION 5X Gen 1 Night Vision Rifle Scope. Condition is Used. I have never taken this to the field. It held zero with no issues. The front bolt head broke off when I was reinstalling. It held zero and I shot another 40 rounds with no change to POI. Shipped with USPS Priority Mail. No international shipping. pvs 14 gen 3 ANVIS tube, IR feature, improved lanyard, with mil spec J-arm. This mil spec auto gated ANVIS tube has some blemishes at the outer edges, gives nice clear image Helicopter pic taken with this tube at about 25 yards. Great price. Condition is Used. Will not ship overseas or international. Im going to extend the sale for 7 more days SO HURRY WHILE SUPPLIES LAST LIMIT TWO PER CUSTOMER. Hunting Wildlife Trap Infrared LEDs IR Night Vision Scope Cameras Outdoor Waterproof SEE UP TO 200 YARDS IN THE DARK PERFECTLY. Condition is New. Shipped with USPS Retail Ground. May ship from different warehouses, from three different countries but all still have a warranty. Two small blems towards Edge not really noticeable when being used. 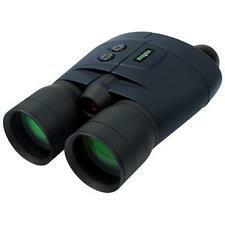 You are bidding on a Retron RN-M01 Night Vision Monocular. Condition is Used. Has been taken good care of. 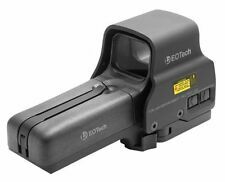 Has built in hi power IR Illuminator. Comes with everything in pictures. Comes with protective carrying case, owners manual I will also include a new pair of batteries. Thankyou and happy bidding. All sales final no returns. LED Module: High Power Emitter with IR850 Pro Driver. Adjustable Picatinny Mount Included. Constructed using aircraft grade aluminum. Material: Aircraft Grade Aluminum. Effective Range: 328 Yards. Color: Black. Quick detach weaver mount. Battery Life:(with IR),20 hours,Battery Life:(w/out IR), 50 hours. They can not have been assembled and disassembled. Built-in, high power IR illuminator. SightMark Photon XT 4.6x42S Night Vision Weapon Sight Photon series Riflescope. Condition is Used and in great shape. Shipped with USPS Priority Mail. Has some very minor wear from being used. It works like new. Includes scope and mounting rings only. This item has been opened and tested. The crystal cleardisplay can also be operated in basic or advanced mode depending on your preference. Ultra high definition ATN 4K M265 sensor with ultra HD optics, no loss of resolution. Record Video in sharp 1080P and simultaneously WiFi Stream to your iOS or Android smart phone. ATN X-sight II Smart HD Digital Night Vision 3-14x Rifle Scope DGWSXS314Z. Condition is Used. Shipped with USPS Priority Mail. Comes with the extra battery pack for up to 10 hours of use, bought it for hog hunting in Texas and then we lost the place to hunt so only used it a few times. Bushnell Equinox Gen 1 2x28 NightVision .It is in great condition. Battery not included. Please ask any questions before bidding. Free USPS priority shipping included. FLIR Scout TK Compact Thermal Vision Monocular, 640x480. The FLIR Scout TK is a pocket-sized thermal vision monocular for exploring the outdoors - at night and in lowlight conditions. Stay Aware, Stay Safe. 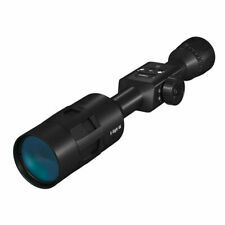 Bushnell 2.5X42 Night Vision Scope 26-0200 has a built-in Dual IR Illuminator! The Bushnell NightVision 2.5 x 42 Scope features a built-in infrared illuminator, to provide extra infrared light for enhanced images in very low light, for use when camping, exploring caves, patrolling warehouses or other locations where there is no ambient light to amplify. Leupold LTO-Tracker Thermal Viewer Observation/Game Recovery 172830. Condition is Used. Shipped with USPS Priority Mail. Item comes in original packaging. Item used once in a residential setting. These Thermal Imaging Monocular by Leupold candetect heat up to 750 yards out, which is plenty of distance to locate your prey on a hunt. You also get at least 3 hours of CR123 battery life from this device. PVS-14 weapon mount. Used to Mount Night vision to your Weapon. This is a MONOCULAR. Good condition, hardly used. Minor battery leak but still functions. Includes NIB NV MT objective Lens 42mm F50/1.2, carry bag, video cable, instruction manual. IR Lights, the Coyote Reaper XXL Infrared Illuminator is it. Want to be able to identify critters at a half mile and beyond?. Then this is the light for you. 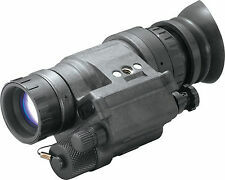 The Coyote Reaper XXL Infrared Illuminator by Predator Tactics screams distance and clarity. Great Milsurp night vision scope from Germany. Includes the original mounts for RPG's, MG3, and HK claw mount as well as the very rare ARMS-7 Stanag mount! Unlike most of these scopes out there in the wild, this setup is ready to plug onto whatever pic rail you want it to, no searching down this out of production mounting solution. 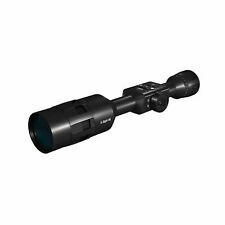 Bushnell 26-2042 Night Vision Monocular 2X42. Condition is Used and not working. Only the infrared light turns on. Shipped with USPS Priority Mail. 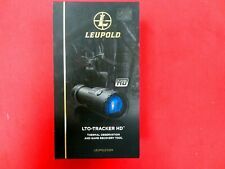 Leupold 174906 LTO Tracker HD Thermal Viewer BRAND NEW! Optics designed for night vision are specially designed tubes that catch and enhance what little light may be in a dim area and enhance it. They do this by grabbing the light available, converting it to energy, multiplying it, and then converting it back into greatly enhanced light. With a little care and knowledge, the right night vision device will be useful in a variety of situations. What types of night vision optics are there? These optics come in a variety of forms to suit your needs, such as night vision scopes, binoculars, night vision monocular devices, and goggles. While each of them provides some measure of improvement to your vision at night, you'll want to choose a type that works for your intended purposes. ATN, Armasight, and Sightmark are all providers of scopes, monocular, thermal equipment, and more. 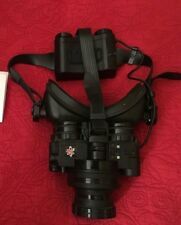 Night vision goggles are one of the more ubiquitous forms of night vision technology is the night vision goggles apparatus. Goggles are separate from a similar device called a night vision monocular, in that they allow for night vision through both eyes simultaneously. Night vision goggles are also notable for having no magnification, usually, and you can mount them on your head for ease of use. Night vision binoculars are distinctive for having two eyepieces and built-in magnification features. Because magnification levels for these devices are high, they are also too heavy for you to attach them to another apparatus. While night vision binoculars typically have intense magnification, you should be aware that the images you see may be dim. However, binoculars work great if you have stationary, long-range night vision duties. Night vision rifle scopes come in two varieties. One is designed to mount onto on existing rifle scope for your hunting needs while the other is a stand-alone scope that is larger, heavier, and replaces a normal scope. Monocular night vision devices are single-eye units that make low-light enhancements at night but without magnification properties. They are usually both compact and lightweight. These features make them portable. They can also be mounted and used on a variety of equipment. These are a great option if you need vision while you are multi-tasking at night. 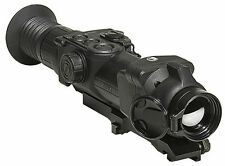 You can also get variations of these, particularly night vision scopes that include thermal optics. Thermal optics are ideal for when you need to distinguish between various heat signatures during a hunting expedition. How do you care for night vision equipment? One of the most important things to remember that is often overlooked when it comes to these vision devices is the power. You should always deactivate your optics when you are in a well-lit area and turn them on only in the dark or at night. Bright lights can damage the aspects of your equipment that relate to vision and thus shorten their overall lifespans. And while you might be using night vision goggles in environments that are quite humid or damp, prolonged exposure to heavy rain or thick fog can also cause problems for these devices.